Online virtual worlds and reality games are both areas of growth. Virtual worlds are games which have huge environments and many players while reality games are games which involve real world actions like making phone calls. Virtual worlds include games like World of Warcraft and Second life. In order to succeed, virtual world games require users to contribute time and money and much can be learnt from their success or failure. Business opportunities include sponsorships or even owning virtual land. Reality games include events like Scoot where players need to use a mobile phone and visit real places to get clues. Games like this can be a good way of introducing players to new technology or encouraging them to use their mobile phone. As mentioned in Part 1 of Online gaming, the video gaming industry continues to grow and is set to overtake the movie industry. In Part 2 I will be covering virtual worlds and reality games. Virtual Worlds/Massively Multiplayer Online Games - Where users are placed into a virtual world and can interact with the virtual world and other players. A good example would be World of Warcraft or Everquest. Games like this appeal to people familiar with computers and videos games. Reality Games - Reality games are online games which take place partially in the real world. Games can consist of visiting 'real' websites and may involve real world actions like e-mails being sent to your personal inbox or recorded messages being made to your phone. A good example would be The Beast, which was an alternate reality game designed to promote the Steven Spielberg movie A.I.. There are various kinds of virtual worlds and massively multiplayer online games (MMO). Some are small and can be played straight from your internet browser while others come on a DVD and require installation. Some virtual worlds are fantasy based, some science fiction based and some based on real life. It all really depends on what you are looking for in an online game. Simultaneous gameplay - All user actions take place in the virtual world at the same time. Persistent Environment - The environments in the virtual world exist even when there are no players there. Social Worlds - These are geared towards socialising or creating communities. A good example is Second Life, which doesn't have a specific goal except to socialise with others and explore. Objective based Worlds - These are virtual worlds with specific objectives like attacking enemies or earning money. A good example is World of Warcraft where the objective is to attack enemies, earn money and improve the abilities of your in-game character. Successful virtual worlds and MMO's will blend elements of the two. For example Second Life is primarily a social virtual world but there are games within the virtual world like treasure hunts. World of Warcraft is an objective based virtual world where there are plenty of creatures to attack and items to find, but there is also a strong social side to this world where players can form teams and go on adventures together. Here's a really good video on Treasure Hunts on Second Life and also includes examples of how companies are using Second Life in the game to promote their brand. 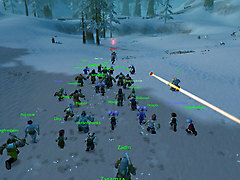 Unlike Second Life, World of Warcraft is focused around fighting and teaming up with others to complete objectives and has a different focus. The first video is a review of the game showing off the large virtual environments and creatures of the game while the second video discusses how virtual worlds like World of Warcraft can be used in 'learning' research to better understand how people learn. Avatar - Your virtual representation in the world. Subscription cost - Cost to access the virtual world. This is usually charged monthly. Microtransactions/Micropayments - Purchases using small amounts of real world cash to enhance the virtual world experience. For example, you can spend a couple of dollars to purchase new clothes for your avatar. Here are a couple of examples of virtual worlds and MMO's starting from simple virtual worlds to the more complex and unique virtual worlds. Gaia Online initially started off as a message board and forum website but has slowly transformed itself into a thematic website very similar to Neopets. As GigaOM covers, Gaia Online is a teenage oriented website with a virtual world and everyone has a virtual avatar. According to GigaOM, Gaia Online now has about 300,000 users that log in daily and the average time a user spends on the site is 2 hours. As you can see, the website is youth oriented. Gold coins are the currency in Gaia Online. By spending gold coins, you can customise how your avatar looks. You can also purchase items such as cars and houses for your avatar. Because Gaia online is really a message board website and earning gold coins revolves around social participation, Gaia online would be classified as a social world. Using a gift card from a friend. Buying a card at a store like 7-11 and Walmart. Purchasing using the phone payment system. 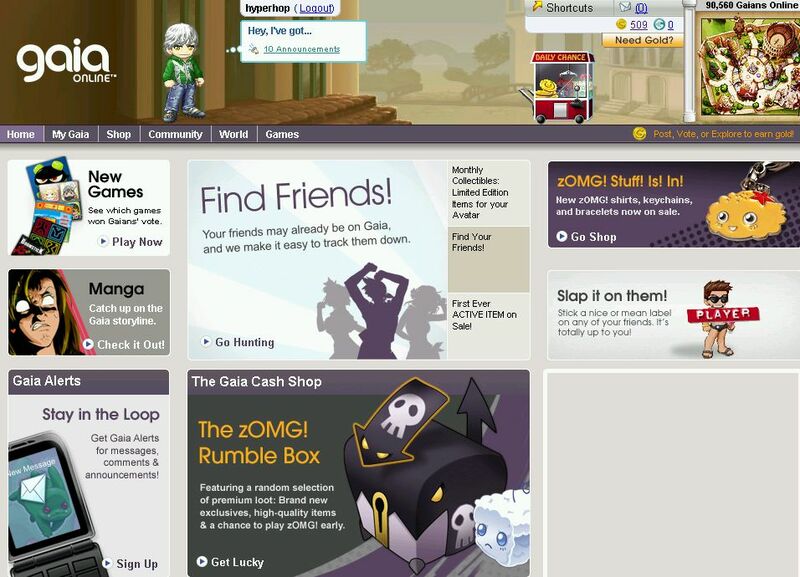 Advertising - Like Neopets, Gaia online features embedded advertising as well as more traditional banner ads. Micropayments - Real world money spent on purchasing gold coins. Internet Evolution - Interview with Craig Sherman, CEO of Gaia Online. ourWorld by Flowplay is a casual gaming site, which has a virtual world similar to Gaia online. ourWorld is currently targeting tweens and teenagers like Gaia Online. As recently covered by Fox Business, the focus of the website is around playing casual multiplayer games to earn flow points and socialising with other players. Coins are the currency in the virtual world that can be used to purchase virtual items for their avatar. Customising your avatar is a large part of ourWorld just like in Gaia Online. Unlike Gaia Online which is funded by micropayments and advertising, ourWorld uses a freemium business model where it is initially free to play but you need to pay a subscription fee to unlock more advanced features. Flowplay is currently working with advertisers to allow players to purchase virtual items as well. Subscription - Users must pay a subscription to unlock more features and get the most out of ourWorld. Micropayments - Real world money spent on purchasing items. 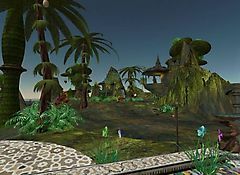 Second Life by Linden labs is a massively multiplayer world where players create an online avatar and can then wander around the virtual world. 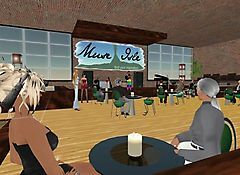 In a true virtual world like Second Life, any actions you or others take in the virtual world are shown to other Second Life players. For example, if you walk into a virtual store in Second Life, other players in the virtual store will see your virtual avatar walking into the store. 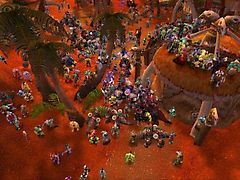 Although this virtual interaction seems trivial, it is important to remember that such detailed massively multiplayer worlds where hundreds or even thousands of people are performing actions simultaneously in a virtual space has only really taken off with broadband internet speed and better computing speeds. Second Life uses a freemium business model to earn revenue. As shown below, on a basic free account you can interact in the world but can not own property while premium payers on a subscription can own property and receive a weekly stipend of the virtual currency Linden dollars. Being a social virtual world the main idea is to explore and interact with the world and socialise with other players. Just like in the real world, Second Life has its own economy and players can purchase objects from each other with Linden dollars and can even redeem Linden dollars for real dollars. Second Life is so big it even has its own world map known as SLurl. SLurl is powered by a google maps and works in exactly the same way. Just click and drag to explore the map I've embedded below. Subscriptions - Users must pay a subscription fee to unlock advanced features like ownership and receive a weekly income. Virtual land subscription - Real world money spent on purchasing and maintaining virtual land in Second Life. Micropayments - Real world money spent on purchasing Linden dollars. World of Warcraft is an online massively multiplayer fantasy roleplaying game by Blizzard Entertainment. As in most role playing games, you create an online avatar and travel around the virtual world attacking monsters, gaining experience, buying items and improving your character. World of Warcraft would be considered a objective based virtual world. Like Second life, you can also see what other avatars are doing in the world at the same time. For example, if someone else is attacking a monster in a grassy field you can actually see the fight happen. World of Warcraft is a subscription-based so players must pay a monthly access fee to play the game. 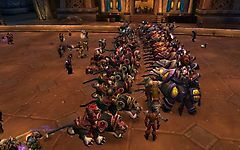 Currently there are 10 million subscribers to World of Warcraft and as the website World of Warcraft Insider mentions, World of Warcraft remains one of the most successful massively multiplayer online virtual world. Retail sales - The initial purchase of the game DVD. Subscription - The monthly access fees to play the game. Licensing - Cybercafes must pay a license fee for customers to play World of Warcraft. GigaOM - On how and why World of Warcraft is so successful. DFC Intelligence - On World of Warcraft and its success. 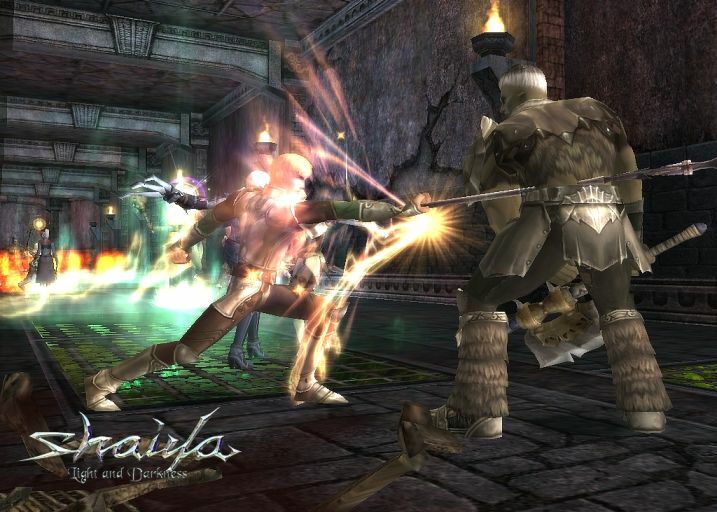 Shaiya by Sonov Entertainment and published by Aeria Games is a massively multiplayer fantasy role playing game (MMORPG) that was recently voted as the best massively multiplayer role playing game of 2007 on Game Border. Shaiya is a game similar to World or Warcraft where players create a character, attack monsters, explore the virtual world and adventure with other players. Unlike World of Warcraft, Shaiya uses a freemium business model. Shaiya is free to play but relies on microtransactions and advertisements to make profit. By spending a couple of real world dollars players can purchase Aeria points. Aeria points can be used in any Aeria Games game, not just Shaiya. In Shaiya you can use Aeria points to buy special items in the online store to improve your avatar. Advertising - On the main webpage of Shaiya there are standard internet banner advertisements which are paid for by advertisers. Rocketon is a upcoming virtual world different from the above virtual worlds. Rocketon is a virtual world that runs parallel to your web browser where your avatar travels around with you when you surf the web. As seen in the video, Rocketon users surf the web together with their friends, chat and play games together. So the virtual world ties in with the real internet. Some websites, which are sponsor websites, will have special items to attract Rocketon users to surf there more often. Rocketon is currently targeting the tween and teen generation. Sponsorship - Sponsors will pay Rocketon to advertise on the Rocketon virtual world. The advertising could be in the form of games, virtual items or even treasure hunts depending on what the sponsors want. Mashable - A review from a Rocketon tester. PMOG - A game very similar to Rocketon. Neopets and Gaia online's success shows us that massively multiplayer virtual worlds can be as simple as a few thematically linked pages and a virtual avatar. In the Wealth of Networks, Yochai Benkler speaks of how in a networked information society the rewards are often social not just monetary. This is most obvious on websites like Gaia online or ourWorld. Users are rewarded for social participation with virtual world currency, which can then be used to further customise and improve their virtual presence in the world. Despite being virtual, people can and do maintain social and emotional investments towards their online avatar and the items in the virtual world. This emotional link is precisely why people will pay real money to purchase virtual items to improve their avatar. Both the social investment and reward system leads to deeper participation in the virtual world as users become more attached to their virtual avatar. There are number of research publications on humans and the effect of having a online avatar at the Virtual Human Interaction Lab. Much like e-mail or social networking profiles, virtual avatars are becoming a common part of a person's online identity. For example, many people will have a Second Life avatar or a World or Warcraft avatar. As Business Wire reports, Gartner Consulting predicts that 80% of active internet users will have a virtual avatar by 2011. From a business point of view, there are two resources users provide to the business when it comes to virtual worlds. Time and money. Time which refers to users attention and social involvement in the world. Money which refers to real world cash. Companies need its users to contribute both in order to make revenue and survive. The same points can be applied to other virtual worlds like Second Life or World of Warcraft. A successful virtual world balances both time and money. In the area of virtual worlds and massively multiplayer games it is important to note that there are plenty of examples of failure even with large publishers such as Electronic Arts. Bad marketing - Not attracting the right users. Insufficient capital - Not able to cope with demand and unable to expand. Technology failure - Too many users. Lack of social mass - Too few users. Lack of updates - Virtual world not dynamic enough. Poor design - Too hard to understand or play. One common feature of failed virtual worlds is the lack of updates and the lack of developers listening to the community. Coming back to the concepts covered in Wealth of Networks, businesses should not be treating users as consumers. Particularly in worlds like this which are dynamic, it is important for developers to listen to the users and involve them in the development to make the virtual world even more attractive to its users. Involving the user community in development. Virtual worlds are part of Web 2.0 and will continue to be a significant part of our culture. It is important to understand their successes and failures in order to succeed during the era of social media. Much of what has been covered can also be applied to any social networking website since games and virtual worlds are a form of social networking over the internet. Virtual worlds aren't just for entertainment, there are a variety of academic and business purposes they can be used for. Here are a number of videos on learning in a virtual world environment. These videos are centered around Second Life environments because Second Life is so popular. Here's a video explaining the advantages of 3D learning over 2D learning by Dr Karl Kapp. His wiki MSIT Second life and blog Kapp Notes cover 3D learning in more detail. Here's a video which covers a variety of ways Second Life can be used to educate users. The environment is closer to reality. For example, the 3D models reflect the objects being discussed in both size and shape. The environment can simulate reality and be used to showcase events and experiments in a cheap and safe manner. For example, a virtual chemistry exhibit can be used to show the reaction between various chemicals without requiring the actual chemicals or exposing learners to the dangers of the actual chemicals. The virtual exhibit can easily be reset once the learners are done with it. It is easy to track the learners' attention as the virtual avatars will fall asleep when the user does something else. Environments can provide a greater sense of immersion. For example, an environment can replicate historical sites and provide a better experience than looking at photos or diagrams in a book. It encourages collaboration between learners. So what opportunities are there for Vodafone in the virtual world area? Where Vodafone could sponsor items within the virtual world that improve the virtual world avatar in some way. This could be a good way of marketing the Vodafone brand. Where users can check up on their virtual world from their mobile phone or call other people from the virtual world. Of course Second Life isn't the only virtual world that this can be done in. There are plenty of other virtual worlds Vodafone could look at. This is in fact very similar to Vodafone's mobile phone social network Self Central. But instead of creating a mobile only social network, Vodafone could look at creating a world that is both available on your mobile phone and online. Perhaps the more you spend with Vodafone, the more virtual currency you get and the more you can spend on customising your avatar. Being such a large corporation, using a virtual world as part of the intranet could be a good way of learning and sharing information across various countries as already covered above. Virtual worlds can be used as a valuable form of feedback. For example, you could build virtual stores and ask Vodafone employees what store layout they prefer. Virtual worlds can offer a richer multimedia experience than traditional web browsing due to the 3D environment. Different businesses will benefit from different parts of virtual worlds. Virtual worlds can be used for training and simulation. One of the best examples was a bank branch customer simulation. Virtual worlds can provide a better face to face experience over the internet since users can see other users. Like all business opportunities, companies must do research before entering. Virtual worlds are a learning experience and a new media. Like a website on the internet, a business' virtual world presence should be integrated with the real world operations. Virtual worlds are here to stay. MSIT Second Life Wiki - A website which contains a variety of article links to the advantages of Second Life in learning and other areas of education. GigaOM - On the most popular virtual worlds. DFC Intelligence - Success in massively multiplayer online games. Business Week A special section on virtual worlds and the future of the internet. Reality games are games which involve not only the internet but also real world actions like answering e-mails or visiting a location and taking a photo of something there. Games like this are sometimes called alternate reality games. A good example would be an alternate reality event like Scoot. Organised by Newish Media along with the government in Australia, Scoot is a treasure hunt where kids and their families use a mobile phone to help them explore a variety of places in their city to stop the evil Pesky Ones from ruining our world. Players use their mobile to send answers and receive clues via SMS. The clues will then lead them on to the next location where they can learn more about their city. Once players get home, they can continue to play mini-games online through their computer and even win prizes. Scoot has successfully been held in cities like Melbourne and Brisbane and there are plans to continue to hold more Scoot events. A very well published example would be The Beast by 42 Entertainment, which was an alternate reality game promoting Steven Spielberg's movie A.I. The first clue to the game is in the promotional poster for the movie A.I., which has a person called Jeanine Salla as a 'Sentient Machine Therapist' and which leads players to the fictional Bangalore World University website when they search for her name on the internet. As reported in CNN and Wired, The Beast was a futuristic science fiction murder mystery that had players explore a variety of websites and perform a variety of actions to solve the mystery. Players not only needed to surf websites but would receive e-mails and voice messages on their phones. The website Cloud Makers holds a great deal more information on the game and allows players the chance to replay parts of the game. The Beast didn't earn revenue since it was free to play, but it was a very good example of a very successful viral marketing campaign. 39 Clues by Scholastic is a series for 8 to 12 year olds that includes '10 adrenaline-charged books to be released over a 24-month period, 350 collectible cards, and a dynamic online game where readers uncover information beyond what is revealed in the books and cards and compete for prizes'. Like The Beast, 39 Clues involves the internet as well as other media forms like books and cards. The idea is to create and release a franchise across various media in order to appeal to as many kids as possible. Merchandise sales - Sales of the novel and cards. Perplex City by Mind Candy is an alternate reality game taking place mostly in another world known as Perplex city where everybody is obsessed with puzzles. The series kicks off with an artifact known as 'the cube' being stolen and buried somewhere on Earth. 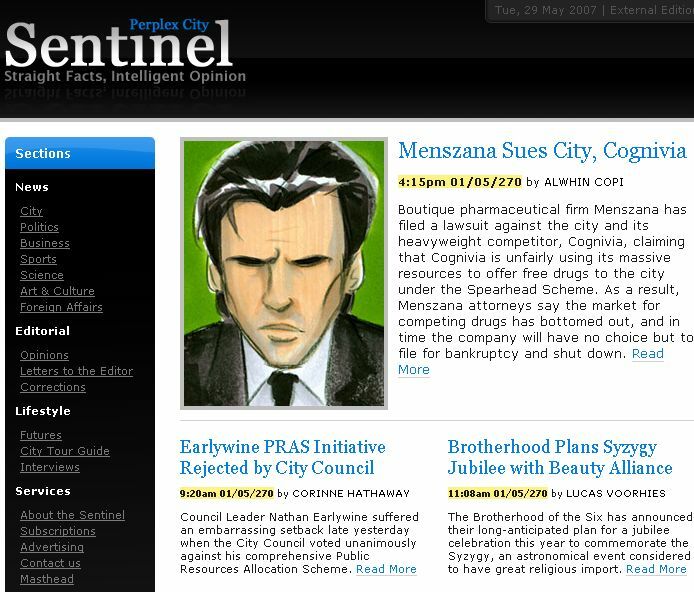 Aside from the main website, Mind Candy also maintained fictional blogs and websites such as the Perplex City Sentinel. Players could follow the Perplex City events via these websites and solve the online puzzles for free. Rather than using the game as a marketing vehicle for someone else, Mind Candy wanted to profit from this venture. They decided to design and sell collectible puzzle cards that tie in with the game. These puzzle cards were sold in packs in stores. In each puzzle pack were random collectible puzzle cards and each card is somehow tied into the larger plot. The cards also have a unique ID to it which the player could register online. In this way, the free portions of the game were sponsored by the card pack sales. Merchandise sales - Sales of the card packs. Wired - Article introducing Perplex City on its initial launch. Business Week- An interview with the CEO of Mindcandy on Perplex City. Reality Games are an interesting development in the world of games and blurs the line between online and offline. With online games and the adoption of the internet, many people are now expecting an interactive experience as opposed to a passive experience. Reality games then are a good way of providing that kind of experience and can be a good way of introducing people to new forms of technology. How should Vodafone enter virtual worlds? Second Life is just one step that Vodafone has taken in entering virtual worlds. What other ways can Vodafone use virtual worlds? Should it create a virtual Vodafone intranet for use? Virtual worlds are a form of online social networking like Facebook. What can we learn from them? Studying the success or failure of online games is a good way of understanding what attracts users and the direction that the internet is headed in. What else can be learnt? How will reality games grow in the future? Reality games which blur the online and offline are a good way of introducing people to technology. How will reality change the way we think of games and how can Vodafone take advantage of that? How will 'Web 3D' affect Web 2.0? Virtual worlds like Second Life are currently 'walled gardens' completely separate from the web. Will they integrate or will they remain separate? The parallel virtual world Rocketon, provides clues to the possible future of the internet. Online virtual worlds are games which contain huge virtual environments to explore using your virtual avatar.There are two kinds of virtual worlds, social worlds like Second Life and objective based worlds like World of Warcraft. According to companies like Gartner consulting, in the same way that most internet users now have e-mail, most internet users will have a virtual avatar in the future. There are several ways to earn revenue from a virtual world such as collecting subscriptions or charging for virtual items. Vodafone has in fact already entered Second Life and offering mobile calls from Second Life. As virtual worlds are fairly new, there are plenty of other opportunities that Vodafone could look at from buying their own virtual land to creating their own virtual world. As for reality games, there are reality games that take place online and offline and may involve real world actions like visiting websites or calling real phone numbers. Games of this kind are a good opportunity for a company like Vodafone to increase brand awareness or introducing new technology. Here's an extremely comprehensive 50 minute presentation by the creators of the alternate reality game Perplex city. This lecture introduces the idea, their game, revenue models and lessons learnt.